When walking through my local Shoppers Drug Mart, I'm bound to stop at the Essence display to find a new nail polish or blush to add to my collection. How could you not be intrigued by a rainbow coloured display of under $10 makeup, that's actually high quality? After inquiring about the disappearance of my favourite "Stay With Me" lip gloss, the wonderful PR team for Essence sent over a box filled with some vibrant and festive fall makeup. I'm all about the neutral shadows, so these first two compacts of the 3D Shadow are now part of my daily rotation. 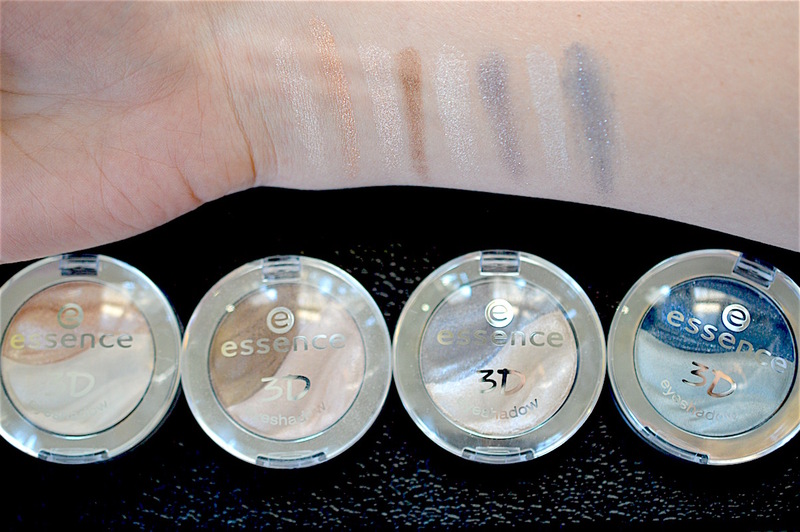 I just realized that they could also be applied wet for a more dramatic look - there are some swatches shown here on the Essence website. The blues are a bit too eccentric for my daily look, but that's what's great about the Essence lineup - you can get one of the more outlandish products for a costume or event, without spending a ton of money. I've been meaning to try the Essence mascaras, but since they have at least 10 options, I can never figure out which one suits my lashes best. After trying the Plump No clump! 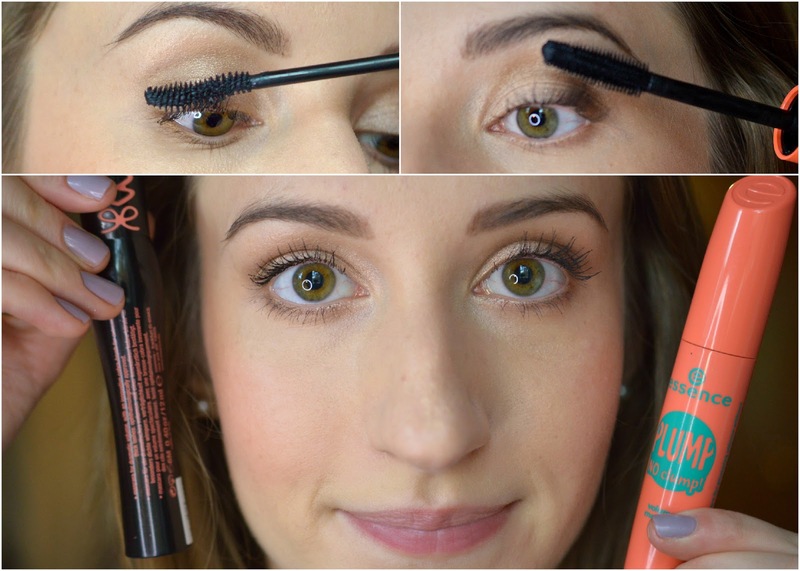 Volume Mascara and comparing it to a tube of Lash Princess, Plump No Clump has made it onto my list of worthwhile drugstore mascaras. They're both pretty good, but Lash Princess wasn't as volumizing or separating. 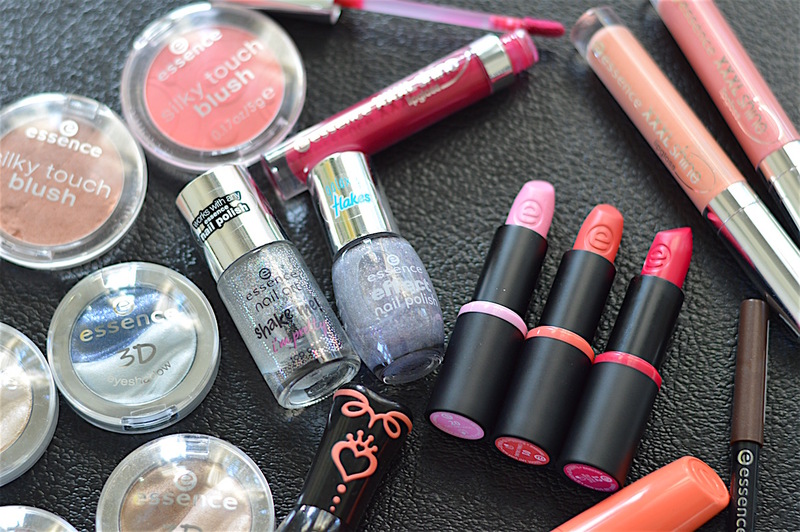 Right when Essence made it's debut in North America, I immediately picked up a bunch of their lip products. 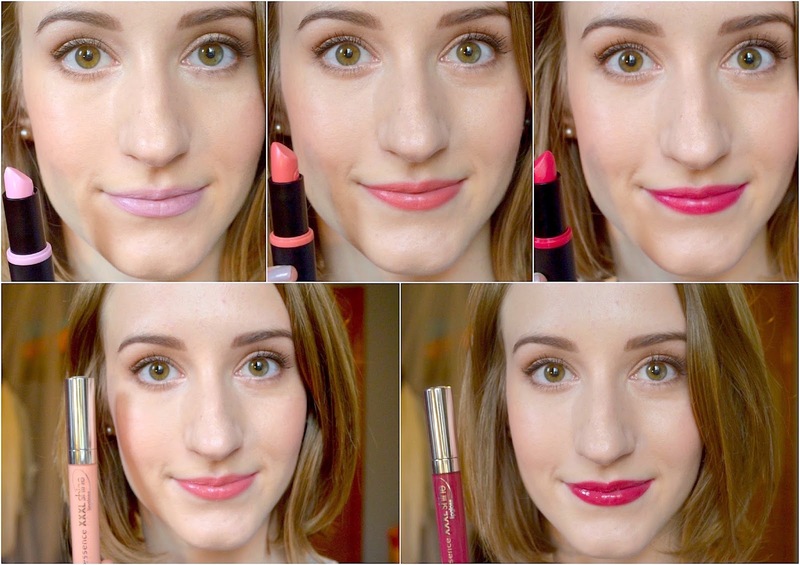 Their long-lasting lipstick is fantastic, so I'm really excited to get some use out of these ones too. 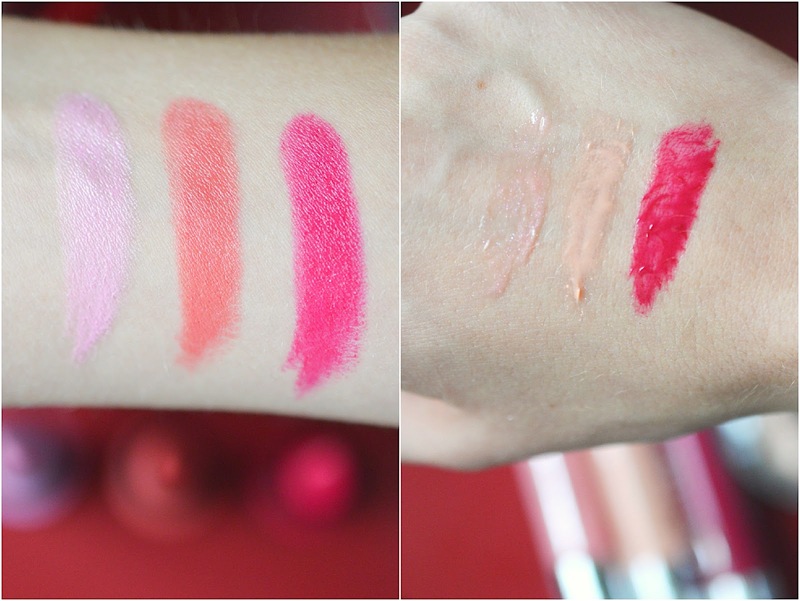 You can see them swatched above and below, with the addition of their XXXL Shine Lipgloss layered in the bottom photos. The Essence nail polishes have changed a lot over the years, first with the bottle shape and now with the formulas and finishes. They're still really good, even though some of my most treasured shades are no longer available. 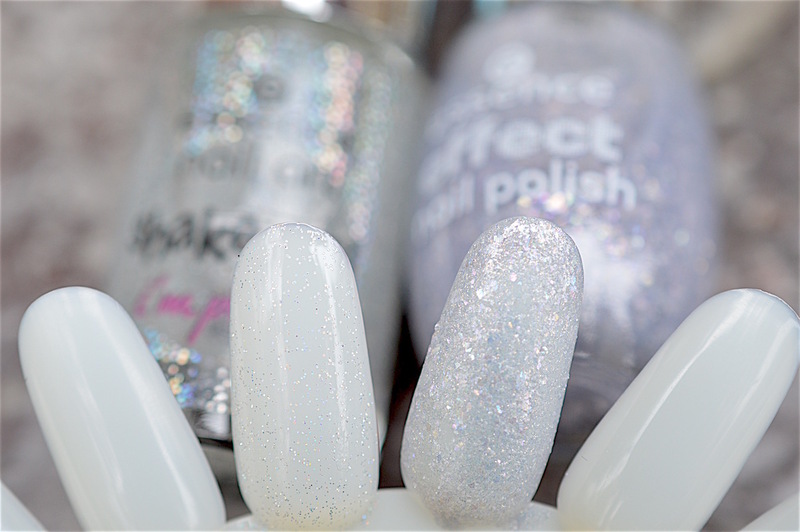 I have been playing around with these two wintery glitter shades, and you can see the "shake me I'm pretty" top coat in my ManiMonday Instagram post linked here. 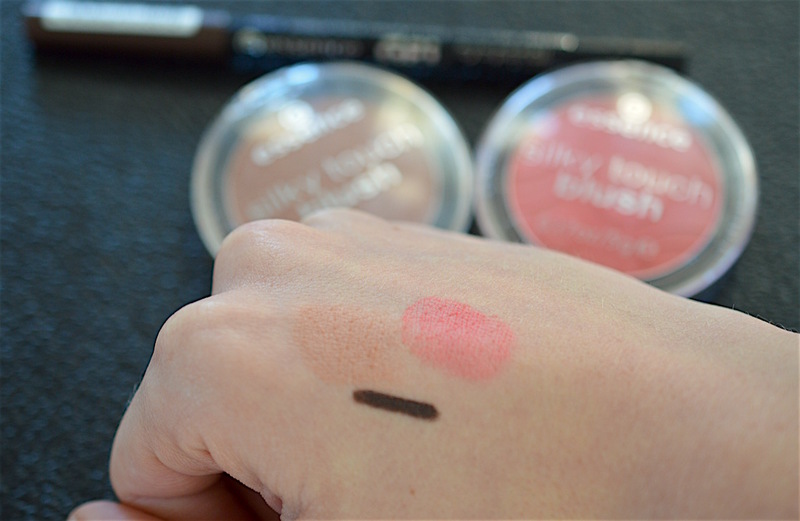 Among my favourite products that I have been using for years, you'll find the Essence silky touch blush, duo sharpener (SO good), I love stage eyeshadow base, and more recently, the gel eye pencil waterproof. I still can't believe they're all around $5. Look out for their next limited edition display at the drugstore, Essence always comes out with the cutest lines of makeup.